marketing campaigns. This is because of good response and conversion rates. But sending just emails and waiting for conversion/response is now old-fashioned already. Nowadays, email drip campaigns are in trend and they give higher conversion rates, automation, and statistics. Email drip сampaigns make email marketing automated which saves your time and money. You can also automate follow-ups. Here, in this post, I am going to show you one of the best and my favorite tools for email drip campaigns. It is Snovio which stole my heart with its unique features and rich user interface and the best part is, it's highly customizable. 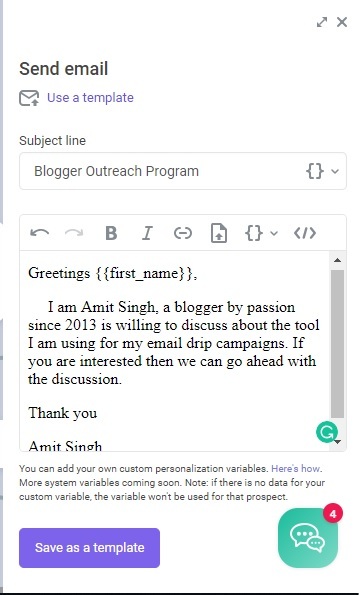 How To Create The First Email Drip Campaign using Snovio? It is very simple to build an email drip campaign when Snovio is here. You can easily generate leads. 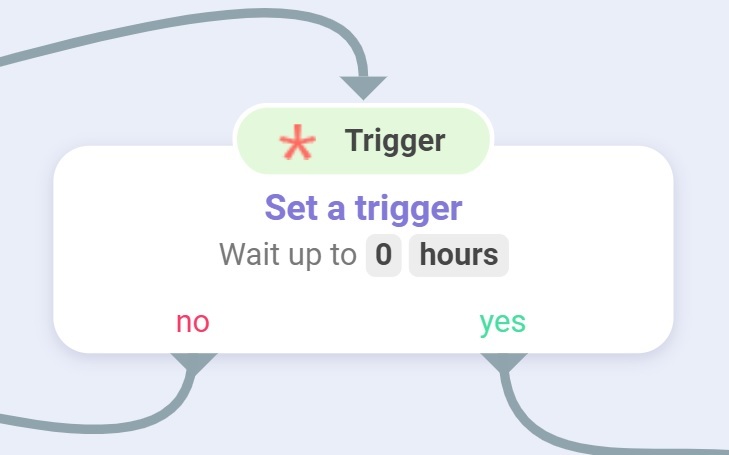 Everything is so simple, you just need to build the email drip campaign with triggers, delays, and goals and hit the start button and then just stay calm and cool. With just a matter of time, you will start noticing the delivery of your emails. So, are you ready to build your first email drip campaign? Yes? Then we are here to guide you. Just read this in-depth guide about this powerful tool that is most suitable for your email marketing campaigns. Let's build the first email drip campaign. I will break the process into 5 simple steps and will explain every step in depth. The first step in our process is to select the email list. You need to click the Start component which you can see in the above image. Clicking on this component will give you an option to select an email list for this campaign. Just select right email list for your campaign. As you can see in the above image, the list I am going to use is named Famous Personalities. This list contains emails of some famous bloggers on the blogosphere. The second step is to write an email for your list. To write an email you need to drag and drop the Email component from the right. Add and click it and you will see a box for writing your customized email similar to below one. You can use variables while writing the subject line such as First Name or Last Name and they will automatically get replaced with the actual first and last name while sending emails. Moreover, when you upload the list of prospects from the PC and it contains other variables, like company name, location, etc., you can add them into the email body, too. Isn't that cool? Yeah, but the next component will be even cooler than this. Contact clicked on the link from the email. 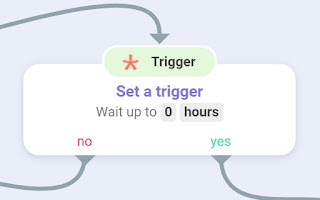 You need to set up a trigger so that you can plan the next phase accordingly. In my campaigns, I prefer to wait until a person clicks the link in the email. If a contact opens the email, you can consider it a pre-success stage. Delay is useful in automating the campaign. Wondering how? Suppose some of the contacts have seen the emails and the triggers have activated but you don’t want to flood leads with emails every time they perform a definite action. So, here delay will automatically pass the automation flow after waiting for a certain period of time. After waiting for the specified time you can finish the campaign and mark it as a goal or you can send a follow-up email to that contact. All this will become automated for you once you start the email drip campaign. Goal is the last step in the process and it tells you that the process has finished successfully. Following all the above steps will give you a flow chart which may be similar to below one. Give the campaign a name and then select an email account and then finally click the Save and start button. This is not the end, guys, you can track the real-time performance of the campaign with the help of a feature-rich dashboard given by Snovio. You can also see how many emails were delivered successfully and how many emails were opened by the contacts along with many more insights. 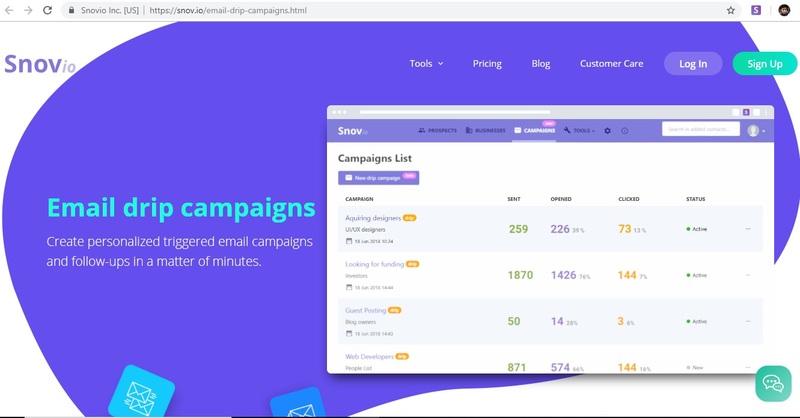 Snovio is such a powerful tool for building email marketing campaigns and it is suitable for every type of people looking for email marketing. Many thanks to the developers for making interface so user-friendly and simplified. At just $29 per month, you can generate a high number of leads with this tool. So, guys, do not wait, signup and start exploring Snovio for free.